If you are currently investing or plan to invest, it is critical that you familiarize yourself with the amazing effects of compounding. Here’s a quick example – imagine you are earnings 10% interest a year on an investment. How long will that investment take to double? At first glance, you may think it would take 10 years (after all, 10% x 10 = 1), but that’s not right. An investment growing at 10% a year will double in about 7.3 years. The reason your investment would double in ~7.3 years instead of 10 is because of the power of compound interest. You aren’t just earning a return on your initial investment, you are earning a return on your initial investment, plus growth from previous years. “The Rule of 72 is a method for estimating how long it will take for money to double at a specific interest rate. The best way to highlight this is with an example. Let’s say you have $1,000, and you want to know how long it will take to get to $2,000 at 2% interest. There is a specific investment style that takes full advantage of the unique math behind compound returns. It is called dividend growth investing. What separates dividend growth investing from other types of investing is its unique focus on businesses that compound wealth over time. Dividend growth investors look for businesses that pay rising dividends year-after-year. For a business to pay increasing dividends every year, it must have a durable competitive advantage. By definition, dividend growth stocks have shareholder friendly managements (in general). A company must care about shareholders to pay them more money every year. In addition, dividend growth investors look for above-average dividend yields. The higher the dividend yield, the better. Receiving rising dividend income every year sounds nice, but how does it work in practice? Dividend growth investing has historically produced enviable returns. Dividend growth stocks have outperformed the market – with lower volatility – from 1972 through 2014, as the image below shows. That is impressive, but it’s far from the only piece of evidence that points toward the efficacy of dividend investing. Consider a special group of stocks called the Dividend Aristocrats. The Dividend Aristocrats Index is comprised only of businesses in the S&P 500 that have paid increasing dividends every year for 25 or more consecutive years. You may think stable ‘boring’ stocks like these don’t offer much in the way of returns. That is simply not the case. The Dividend Aristocrats Index has outperformed the S&P 500 by an average of 2.8 percentage points a year over the last decade. The rule of 72 tells us if that level of outperformance continued indefinitely, an investment in the Dividend Aristocrats Index would be worth double an investment in the S&P 500 in 27 years. When you really think about it, the fact that businesses with strong competitive advantages have provided above-average returns is not surprising. Past performance is no guarantee of future success. With that said, I believe it is likely that high quality businesses continue to generate solid total returns for investors in the future so long as these high quality businesses are purchased at fair or better prices. To build a portfolio that will compound your dividends for you over time, you have to identify the right kinds of businesses. Only businesses that have strong and durable competitive advantages are suitable for dividend growth investing. If you cannot rely on dividend increases in the future, they you are not building a dividend compounding portfolio. There are a few ‘hacks’ to quickly find high quality businesses that are likely to be around for decades in the future rather than years. The first one is to peruse the Dividend Aristocrats Index for ideas. I’ve already discussed the Dividend Aristocrats Index earlier in this article. You can see all 52 Dividend Aristocrats at this link. Note: FMCB is thinly traded; price data was not available for the entire period. Once you identify a high quality business, the next step is to determine if it is trading at a fair or better price. Value matters. If you buy a stock that is wildly overvalued, you will likely lose money over time. A quick way to tell if a stock is worthy of further research is to determine if it is trading for less than its historical average price-to-earnings ratio. You can find historical price-to-earnings data through Value Line. Value Line subscriptions are free through most public libraries in the United States. Ask your library how to access Value Line for free. If a business is trading for lower than its historical average price-to-earnings ratio, it is likely trading at fair value or better. It is important to avoid stocks with high price-to-earnings ratios (anything over 25 is probably too high for an established business). Another important metric in calculating value (and returns) is a stock’s dividend yield. The dividend yield is the total dividends paid per year divided by the stock price. It’s like the interest rate on your savings account. The higher, the better. Systematic risk is the risk of investing in the stock market in general. It cannot be diversified away. Systematic risk is what you take on to benefit from the growth of the overall stock market. It is the risk ‘of the system’. Unsystematic risk is also called business risk. It is risks inherent to one specific business. Unsystematic risk can be diversified away. The more stocks you own, the less risk (and reward) you have from any one specific stock. On the other hand, one can over-diversify. If you own 1,000 stocks, there’s no way to track them all. You also probably own a lot of overvalued stocks, and low quality stocks with poor growth prospects with a portfolio that size. With diversification, you want to take a goldilocks approach – not too much and not too little. Holding around 20 stocks gives you nearly all the benefits of owning a much larger portfolio, with the added advantage of being able to focus on just high dividend-paying businesses trading at fair or better prices. A 20 stock portfolio assumes you will invest an equal amount in each stock. If you invest 90% of your portfolio in 1 stock, and the remaining 20% in the next 20 stocks, you are (obviously) not well diversified. Not any 20 equally weighted stocks will give you diversification. If you invest in 20 oil and gas companies, you won’t be well diversified. It is prudent to invest in high quality businesses in a wide variety of industries. A 20 stock model portfolio is shown below. 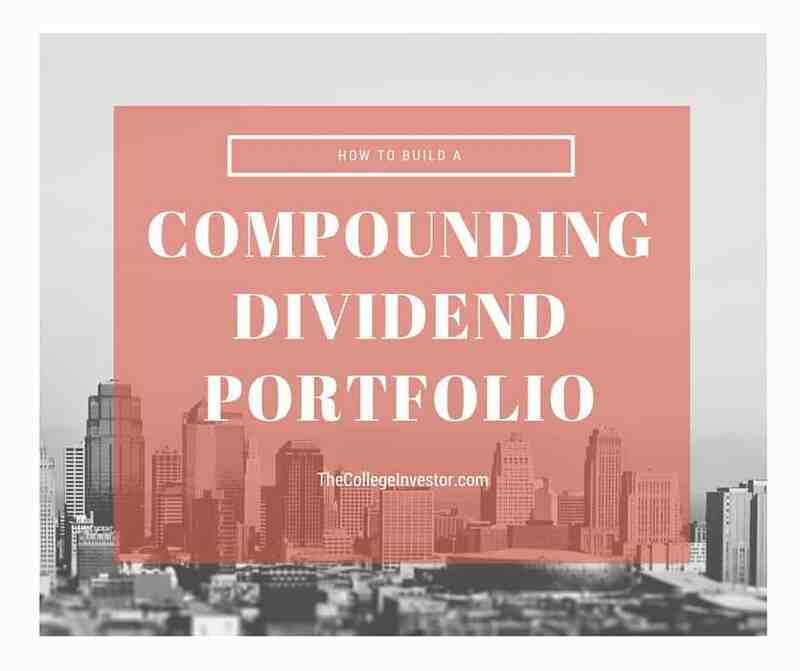 This portfolio is only an example meant to show the type of stocks and diversification required to build a dividend compounding portfolio. It is in no way investment advice. The model portfolio above is well diversified between sectors and industries. It has a higher dividend yield and lower forward price-to-earnings ratio than the S&P 500. Further, it invests only in high quality businesses with long dividend histories. A dividend compounding portfolio will provide a growing stream of dividend income. What you do with that income is up to you. To take full advantage of the effects of compounding, reinvesting your dividend income back into your portfolio will provide even faster growth. The image below shows the fantastic effects of compounding on a portfolio with a 3% dividend yield and a 7% dividend growth rate. Annual income per year starting with $100,000 portfolio is shown. You can see the drastic difference in income as time goes by that results from reinvesting dividends back into the portfolio versus not reinvesting dividends. The purpose of building a dividend compounding portfolio is to provide a perpetual source of growing cash flows. If you reach a point where you can live off the growing dividend income your investments produce, you have reached financial freedom. What’s more, you will never have to touch your principle. Your money will be left compounding indefinitely. This can create intergenerational wealth. About The Author: Ben Reynolds is the founder of Sure Dividend. Sure Dividend helps individual investors build high quality dividend growth portfolios suitable for long-term holding. Thank you for this. I’ve started doing this in the last 2 years. The illustration helps.